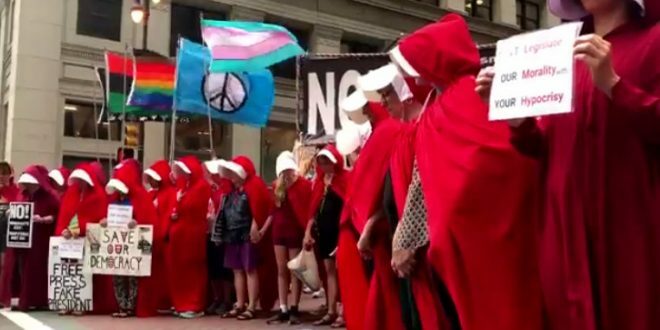 PHILADELPHIA: Handmaids Turn Out To Protest Pence - Joe.My.God. Vice President Mike Pence’s second visit to Philadelphia this summer was again met with protests, this time with a dystopian theme. People dressed as handmaids from the novel-turned-Hulu series The Handmaid’s Tale joined protesters outside of the Union League Monday evening. Pence was hosting a fund-raiser at the club for fellow Republican Lou Barletta, who is running against Sen. Bob Casey (D., Pa.). Samantha Goldman, an organizer of the protest, said before the event that 100 women had signed up to dress as handmaids. Over the past few weeks, they have been meeting in living rooms and coffee shops to sew the scarlet robed costumes and make white bonnets.